For years, the girls and I watched What Not To Wear on TLC. We even got Dad to watch a few episodes too. It's paid off -- there have been times when he's suggested a change based on Stacy London's or Clinton Kelly's advice. My husband not usually a wardrobe consultant, but he's occasionally remembered tidbits I'd forgotten. Although we've all gotten a little tired of the show's formula -- find the victim/recipient, show her what's wrong, enlist her participation, watch her get frustrated, watch her cry, bring Clinton and Stacy in to save her from shopping mistakes, view her transformation -- we love hearing the advice and learning how to best dress different body shapes. It's good stuff. I thought it would be a fun read, and I hoped to learn a few things. Let me just say this: Wow! 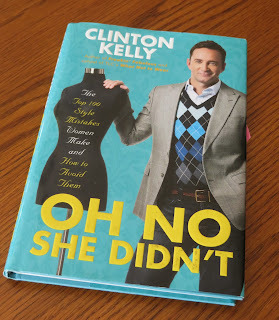 Clinton Kelly's slim tome is packed full of great advice. I'll admit that I knew a lot of it from watching the show, but he gives specifics as in: how long jeans should be, how far a man's cuff should extend from his suit sleeve, and why wearing hooded sweatshirts may not be the best fashion choice (I'm guilty of that one). Be warned, however. This book, while funny, is irreverent. It boldly and unrepentantly makes fun of people who dress in a non-Clinton approved manner. He puts his opinion out there, unvarnished, clear, concise. It's a quick read, and I'm currently going through it a second time. I've also taken some of his advice and decided to find a tailor. Tweaking my clothes to fit me will make a huge difference. I can sense that already. The only hard part is finding a tailor willing to do the work. I tried a local tailor at the mall and she told me that my changes weren't worth her time. Fine. I'll find someone else. I really love new clothes. More than that, I love clothes that fit and make me look like I haven't just tumbled out of bed. Have you ever watched What Not To Wear? Have you ever taken away information from them and used it? FYI, the series finale of WNTW is Friday night, with a Fan Mail special before. I only discovered that show a year or so ago, but I got hooked on it. I'm devastated their ending. I've watched for years, including the original Brit program. Tho they rarely had anyone my age or my slim build, some of the tips are invaluable for everyone and helped me play up my assets and hide my flaws. The biggest change for me is I now wear clothes that FIT instead of loose stuff. I used to watch it but seem to have forgotten about it in the past few years. I did use some of their ideas and it helped.. I'm short, and not skinny. So they had some good ideas but I seem to have known most of them.. Not that I followed them all the time. Julie, I just loved your post. Our middle child, daughter Jessie, has always been a "fashion maven". Even as a little one, she'd wear wonderfully coordinated, funky colors mixed and matched. Now as a professional woman, she is tall, trim and still making sure things look right. And SHE'S the one who introduced me to the show. I've only watched it at her house near D.C. She loves it because it's a break from work and her 4 kids (beautiful, smart, wonderful of course!! No bias here; I'm just their Nana A) and her work has always been about childhood obesity so she has a special interest in how people of all sizes should dress to feel better about themselves. For her sake, I'm sorry it's ending. It was fun. I wonder what show she'll have me watch with her next! I will have to tape it! Thanks, Dianne! It's so much fun, isn't it? I love, love, love the transformations. Wish I could have Carmindy teach me about makeup! That's exactly right. I tended to go loose, but between WNTW and my girls, I've started to wear more shape-defining items. It's been an adjustment, but I'm liking it. I loved the fact that they featured all shapes and sizes, and all personalities. They really seemed to know how to focus on each person's best features. I'm sorry it's ending, too. And what a great story about your daughter. Good for her! That's wonderful! What I liked most about the show was that it kept us talking throughout as we discussed various choices and how different styles might work for each of us. Plus it was just fun. I've watched off and on. I really liked the previous hair stylist, Nick. I always wanted to see what he could do with my hair, short, thick and wavy/curly. My hairdresser said she would come with me because she wanted to see also. They finally had someone with similar hair and guess what, she got the same hairstyle I've had for 30 years - layers. I would so love to have Nick give me pointers. I have a cowlick that sometimes behaves, but mostly doesn't. I'd love to get his input!